Fine Gael and Fianna Fáil's budget shows this government is failing to stand up for ordinary people and failing to invest in our fractured public services. The people deserve better than that. It is time for something different. It is time for a budget, and a government, that is on your side. It is time for Sinn Féin. the cost so far of appealing the €13 billion Apple tax case. the number of people on public hospital waiting lists. the predicted number of people that will be in homeless services on Budget Day. the percentage of people in homeless services aged 24 or under. the number of adults living at home with their parents. the value of property held by tax efficient investment funds. the percentage of children in one parent families that live in consistent poverty. the estimated value of North/South trade that could be affected by Brexit. Budget 2018 comes at a time of unprecedented crises in our public services, particularly in the areas of health and housing. Citizens are dying on our streets while families are forced to bring their children up in hotel rooms or in cramped, overcrowded accommodation. The equivalent of the population of roughly ten counties, some 600,000 people, are currently languishing on hospital waiting lists, many in chronic pain waiting on much needed operations, while other patients are left on hospital trolleys in our A&E Departments. And the winter season is yet approaching. All the while, Fine Gael and Fianna Fáil are engaged in a sham fight over tax cuts that will disproportionately benefit those on higher incomes over those on lower to average incomes. What distinguishes Sinn Féin from these parties is that we believe that citizens have the right to quality public services, the right to a home and to be treated with dignity when they are ill. Sinn Féin is on your side; it is clear that Fine Gael and Fianna Fáil are not. We are very clear that, in the current circumstances, there is no space for tax cuts for the wealthy in this budget and all available resources must be used to begin to tackle the major crises in health, housing and capital infrastructure. Years of state neglect of our public services and governments on the side of developers and property speculators have led to these crises. A wealthy elite still profit off the backs of ordinary people in this state. With this document, Sinn Féin has chosen a side, the side of the ordinary people who have yet to see the economic recovery and need a break. Investment in our hospitals, schools and houses is much more beneficial than the extra euro or two a week that most workers will get from Fine Gael and Fianna Fáil’s proposed tax cuts. It is time for our economy to work for you, the ordinary people, instead of just the wealthy elites. Our health service is broken; it is time to fix it to ensure it works for all of us. Our young people are being left behind; it is time to build a better future for them. Our elderly are neglected; it is time they have the care and dignity they deserve. Our families are under too much pressure, caused by astronomical childcare costs; it is time for a better standard of living. We also outline in this document an ambitious plan for capital spending which is vital if we are to survive the impact of Brexit on our economy. We need the government to adopt the position of the Dáil of advocating for Special Designated Status for the North within the EU to safeguard the rights of all our citizens. It is time for a budget, and a government, that is on your side. Tackling the trolley crisis and caring for older people with 500 more hospital beds, 2 million additional home help hours and 2,500 extra home-care packages. 10,000 social homes and 4,500 genuinely affordable homes. Halving crèche fees for parents while increasing pay across the sector. Increases of €5 for all working age social welfare payments, €4.50 for pensioners and restoring the Transition pension, and €6 for people with disabilities. Smaller class sizes from primary school right through to institutes of technology, 950 resource teacher and SNA positions, €500 reduction to third level student fees. Recruiting 800 new gardaí and 500 civilian staff to combat the legacy of austerity in our justice system. Pay equalisation throughout the public sector. Brexit mitigation plan including enterprise supports and a major capital investment programme. Sinn Féin’s Budget for 2018 would result in direct employment of over 5,000 additional frontline workers with our additional capital investment supporting 16,600 jobs also. * To encourage government investment in capital which constitutes Gross Fixed Capital Formation (GFCF) the Fiscal Rules allows this investment to be averaged over a four year period, meaning that an increase in GFCF will only use one quarter of the fiscal space that an equivalent increase in current expenditure would use in the first year. However certain capital grants do not constitute GFCF and are not subject to smoothing and accordingly have been excluded. ** Fiscal Advisory Council - Pre Budget 2018 Statement, Table 3: Fiscal Space for Budget 2018 - Nominal Resources for New Measures, €650 million. Additional levy on individual income over €100,000 by 7 cent in each euro. The health of the nation is Sinn Féin’s number one priority. We are determined to address the most serious issues in the health service while also reducing health costs for people. The issues affecting our health service are severe; health has suffered from decades of underinvestment and an overreliance on expensive outsourcing and agency staff. The problems in our health service reached crisis point following the financial crash and subsequent austerity years due to funding cuts and recruitment moratoriums. Trolley numbers have reached their worst ever recorded levels while waiting lists have also reached record levels highs, both spiralling further out of control as each month passes. The government have proved time and again that they have no real plan to address this, evidenced by the fact that one in every seven people in the state are on a hospital waiting list. We are also still yet to make any significant steps towards primary and community care. Primary care centres have been built around the country but many do not have additional staff to operate them, while some areas, both rural and urban, are without a GP. All the while, our nurses, doctors, health professionals and support staff are under such pressure daily that the system is demoralising them and huge numbers are continuing to leave to work abroad. Sinn Féin has a plan to begin to address these problems. We have a plan to transform our public health system into the system of choice for patients and staff alike. Home care delivered in the home is the preferred form of care for most older people and their families. Indeed, the vast majority of older people want to live independently in their home for as long as possible, so long as it is medically sound. We are dedicated to the provision of healthcare services and social care services with equal access for all, based on need and to the greatest extent that resources allow. This right is especially relevant for older people and the provision of support for older people. Sinn Féin is committed to ensuring that our older people can live with the dignity and respect they deserve. Therefore, we see it as fundamentally important that older people can live independently for as long as possible. Ireland had the highest per capita birth rate of all 28 EU Member States in 2016. Despite this, the sector has been underfunded over the last 20 years and Ireland is lagging behind international standards. Maternity care has been left in crisis, and a series of scandals has undermined confidence in the sector. Added to this is the fact that our maternity services are severely understaffed, lacking both midwives and obstetricians. Emergency Department (ED) services have been at crisis point for some time; the number of people left on trolleys is at the highest ever recorded since the Irish Nurses and Midwives Organisation started collating such figures through the ‘Trolley Watch’ survey. The trolley crisis is a symptom of the malaise that is endemic across the wider health system. There were 862 less hospital beds in 2015 than in 2008. However, this is not just a bed problem; there are insufficient staff in the acute hospital system, insufficient exit packages and home care options, as well as a lack of nursing home beds to cater for those who cannot be cared for in their home. The average annual running cost for one bed is €306k, which is inclusive of staffing, theatres, laboratories, non-clinical staffing, and other running costs. It is a fully absorbed cost. The overwhelming body of evidence shows that charges for drugs can lead to higher costs on the health budget in the medium to longer term, not to mention the serious strain and ill-effects they can have on the health of those who need medications. Prescription charges for medical card holders were originally introduced under the Fianna Fáil-led Government and were subsequently increased by Fine Gael during their last term in Government. While charges were reduced in the last Budget, it is not enough, we would seek to reduce them further and work towards their abolition. There has been a drastic scaling back across the main fields of public-funded dental provision including the Dental Treatment Benefit Scheme (DTBS) and the Public Dental Service (PDS). These shortsighted cuts resulted in an increase in the use of more complicated and expensive emergency treatments as a direct result of the removal of opportunities for prevention and early intervention. This situation has undoubtedly led to a significant deterioration in public dental health. Many communities across the State experience long and dangerous waiting times for ambulances. We cannot have a postcode lottery when it comes to provision of ambulances. The National Ambulance Service (NAS) is a key public service and the government must guarantee basic levels of care across the State. The NAS Capacity Review Report showed that capacity needs to be increased to meet demands. It pointed to the need for increased resources in terms of personnel, vehicles, and technology. Disability is a societal issue, affecting people of all ages and their families, both directly and indirectly. 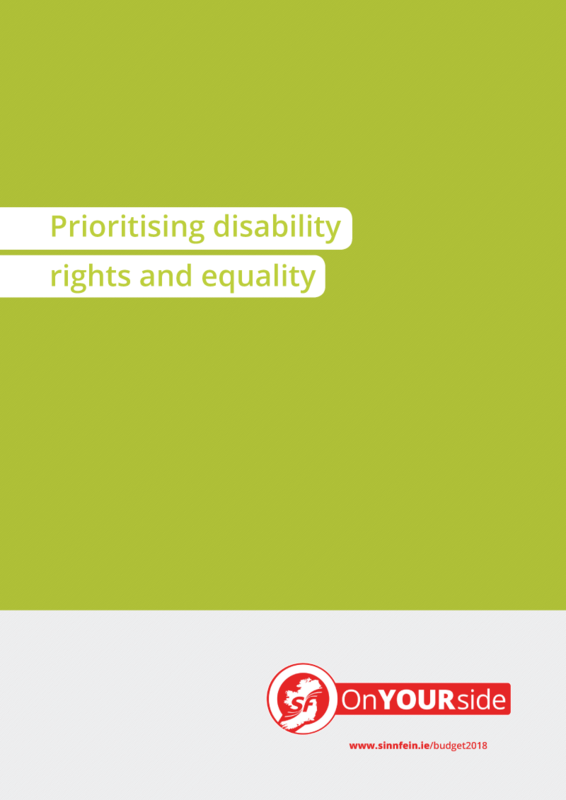 We want to see a society in which all citizens, including those with disabilities, can play a full and independent part in all aspects of life, relying, as far as possible, on mainstream services for health, education and employment but with the support of tailored disability services where necessary. General Practitioners are the cornerstone of our primary care services and we must ensure that we have a supply of GPs for the whole of the State. This means not only training more GPs but also making the profession more accessible and attractive through lifting the burdens created by self-employment and directly employing GPs. Such measures would ensure that our primary care centres are fully and appropriately staffed so that we can deliver a wide and full range of care in our communities, taking pressure off the acute hospital system. It would also allow for the prioritisation of rural areas that are struggling to attract GPs and urban areas where services are overstretched in the deployment of the new salaried posts. Decades of mismanagement and underfunding of mental health services have left us with a service which does not meet the needs of the people who depend on it. In 2017, Mental Health accounted for just 6.4% of the overall health budget and saw a paltry increase of just 1.8% on its 2016 spend, well below what was necessary to implement reforms and barely enough to maintain the previous year’s performance. Bed numbers have dropped by 85% in 30 years, while staffing levels have dropped on average by 20%. There is 800 less staff than before the economic crash and only 53% of Child and Adolescent Mental Health posts are filled. Ireland has the 4th highest teen suicide rate in the EU/OECD and cases of self harm were 9% higher in 2015 when compared to 2007. Severely distressed and at risk people are left with no choice but turn to A&E’s and Garda Stations as no 24/7 service exists. For decades, mental health funding has been too low. Funding levels must see a significant annual increase until it reaches a minimum of 8.24% of overall health spending as recommended in A Vision for Change (AVfC). This funding would provide for increases in staff levels in line with AVfC recommendations and work to achieve the development of 24/7 crisis interventions services and increased access to primary care counselling services. Community mental health services need to gradually switch from the current Monday to Friday daytime hours to a model which is flexible to the needs of those who depend on it. This requires the services to move to a seven day week roster with a Community Mental Health professional available through the weekend to support those in distress due to mental health issues. Additional crisis houses must also be established. Priority should be placed on delivery in areas with higher rates of suicide and self-harm. (CAMHS) Teams - €8.91 million in 2018 (full year cost €11.88 million) There are, as of July 2017, over 2,400 children and young people awaiting assessment by CAMHS. While many may have been better served by a functioning primary care counselling service, they have nowhere else to go. A Vision for Change recommended 2 teams per 100,000 head of population which would mean at least 95 based on current population figures. At present, there are only 67. To provide additional support to those who have a mental health issue and intellectual disability to ensure they receive the best care for their specific needs. These roles assist in early identification of developing problems, as well as advice and liaison services. This helps to avoid crises and protect the independence of the person. There is an urgent need to reopen the 11 CAMHS beds in Cherry Orchard Hospital that were closed in 2017 and increase the number of CAMHS beds overall as recommended by A Vision for Change. Urgent government action is required to reopen those beds and to maximise CAMHS bed capacity in existing units within guidelines for staffing and safe and good practice. Early intervention through Primary Care is key to successful mental health outcomes. This is not only better for the patient who is treated in their community but is much more cost effective for the service if hospitalisation or long term care is avoided. Provide additional hours through primary care in areas with Direct Provision Centres for people who have experienced trauma before and during seeking refuge in Ireland. A 60% increase in the number of posts for Nurses working with general settings and A&E to find appropriate treatment for those at risk of suicide. Addiction is a public health issue. The problem of addiction requires effective strategies designed to reduce social, community and individual harm. It is a problem that has particularly affected marginalised communities experiencing wide spread social and economic deprivation. Drugs, alcohol and gambling addiction adversely affects all aspects of a community’s life. Most significantly, drugs addiction has resulted in the death of thousands of people across the country. Despite this, over the last number of years, there has been a reduction in the expenditure and allocations directly attributable to drugs programmes. The resulting cumulative cuts have had a negative impact on service provision. There now needs to be significant investment to restore existing services or develop new services particularly aimed at reducing harm caused by drug use and which will safeguard the health of drug users. The most vulnerable people in our society continue to live with the consequences of decisions made by Fine Gael and Fianna Fáil in previous, regressive Budgets. Carers, lone parents, young jobseekers, older people and people with disabilities are still suffering to cover basic costs on a daily basis. Latest figures from the Survey on Income & Living Conditions show that 26.2% of children in lone parent families are living in consistent poverty. This is more than three times the rate of consistent poverty among children to two parent families. This is a clear indicator of where Budget priorities must lie. 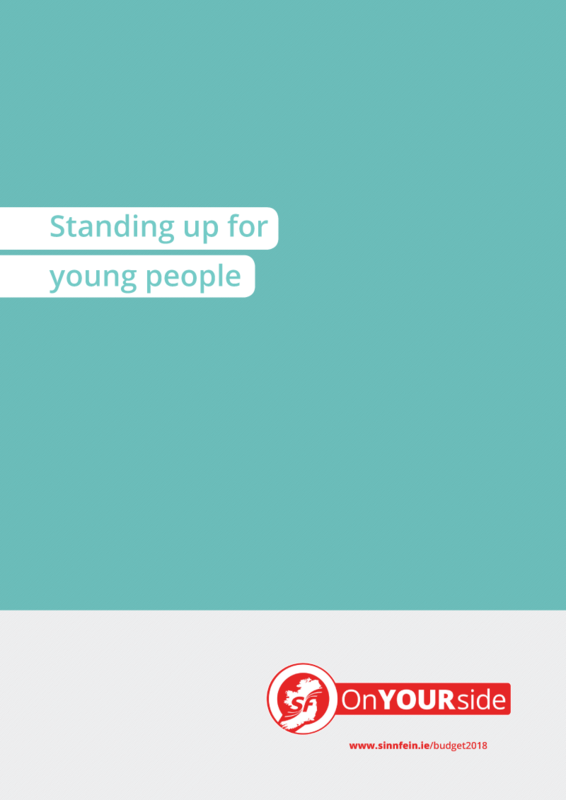 Discrimination is rife in our social protection system from young Jobseekers to older people and their State Pension. As this discrimination is ignored by Government, it continues to impact more and more people. Sinn Féin believes that there should be no place for age discrimination and gender discrimination in our social protection system. This discrimination must end. In recent years, people have not only had to suffer cuts in their payments, but a rise in the cost of living. Going forward, at the very least, social welfare recipients must be protected from rises in inflation. This provision of €182.2 million increases all weekly social welfare payments, including Family Income Supplement, in line with the forecasted inflation rate set out in the 2017 Summer Economic Statement for 2018 i.e. 1.2%. This measure will ensure that jobseekers are more adequately supported as they try to source and secure sustainable employment. The increase provided for in Supplementary Welfare Allowance will assist those who do not have enough income to meet their needs and those of their families. 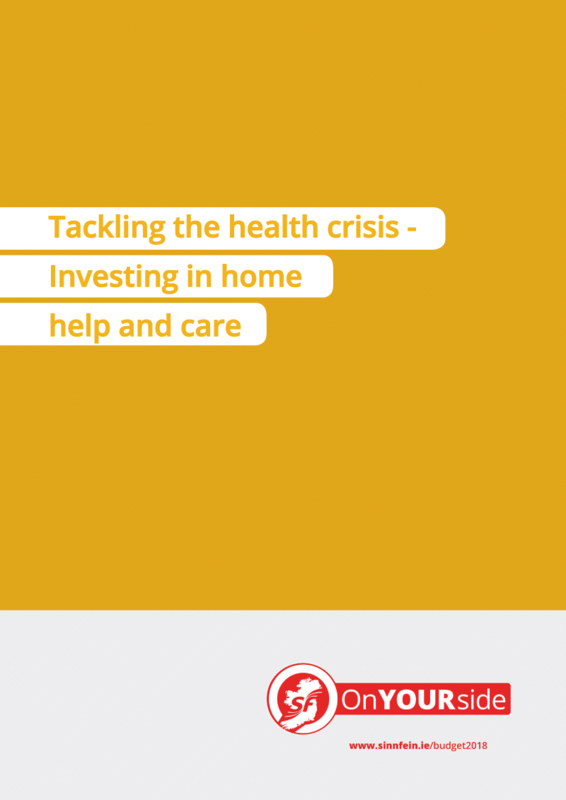 According to Family Carers Ireland, carers save the State approximately €4 billion every year providing over six million hours of unpaid care every week it is vital that they are supported while undertaking this work. This increase will directly assist lone parent families and their children. This is an important targeted measure given the level of poverty being experienced by children in lone parent families and the ongoing shortage of affordable afterschool care. This increase will assist low income families where a lone parent or parents are employed in low paid work. This is another targeted measure directed at reducing poverty levels among children. While protecting those in receipt of Disability Allowance, Blind Pension, and Invalidity Pension from inflation, we must also begin to recognise the additional costs incurred by people with disabilities and therefore propose to increase these payments by €6. Sinn Féin will end the continued discrimination against young Jobseekers. The level of payment awarded to Jobseekers should not be dependent on age. There is no difference in the cost of living for Jobseekers based on age, nor should there be in their payment. As a first step, we propose to increase Jobseeker Payments for those aged between 18 and 24 currently receiving €102.70 and those aged 25 currently receiving €147.80 by €30. Sinn Féin recognises the increased costs impacting older people, particularly since the introduction of prescription charges and the family home tax. This increase will support older people to live with dignity and without the fear of affording basic needs and bills. Sinn Féin want to see the pre-2012 pension bands and rates restored to ensure that women are not discriminated against in the calculation of their State Pension payment. So far, 35,000 people have been left with a lesser pension payment that they would have received had they retired before 2012. This is as a direct result of changes made to the bands and rates and must be reversed. Given the tight fiscal space available in 2018, we propose a start date for this measure of 1st July. There are more 65 year olds on a Jobseekers payment today than any other age in the State. This is due to the Government’s incompetence to plan properly for the consequences of increasing the pension age to 66 in 2014. Those contractually obliged to retire at 65 are being forced onto a Jobseekers payment losing out on their State Pension for one year and receiving €45 per week less. Sinn Féin wants to see a State Pension (Transition) restored until such time as mandatory retirement ages are abolished and older people are guaranteed a fair and sustainable pension at retirement via a comprehensive programme of pension system reform. The work of CE participants in communities right across the State is invaluable and without it, our communities would suffer particularly, in rural Ireland. Sinn Féin wants to see an additional 1,000 places put in place for the benefit of participants and communities alike. Sinn Féin has long advocated for the inclusion of equality budgeting/proofing across government department budgetary and policy development processes. We first introduced Equality Budgeting legislation in 2013 and again in 2016 when our Public Expenditure Spokesperson introduced the Equality Proofing Bill to provide for equality-proofing of government policy, budgets and public bodies through equality impact assessments. Both the current Programme for Government and government’s budget for 2017 contained gender and equality proofing commitments, but the meat has yet to be put on the bones of the necessary implementation and reporting processes. Sinn Féin supports the National Women’s Council of Ireland Budget 2018 recommendation that government publish a Gender Equality Statement alongside Budget 2018 setting out its equality objectives for the coming year, however we would include the gender statement within a wider human rights and equality statement as advised by the Human Rights and Equality Commission alongside equality impact assessments. 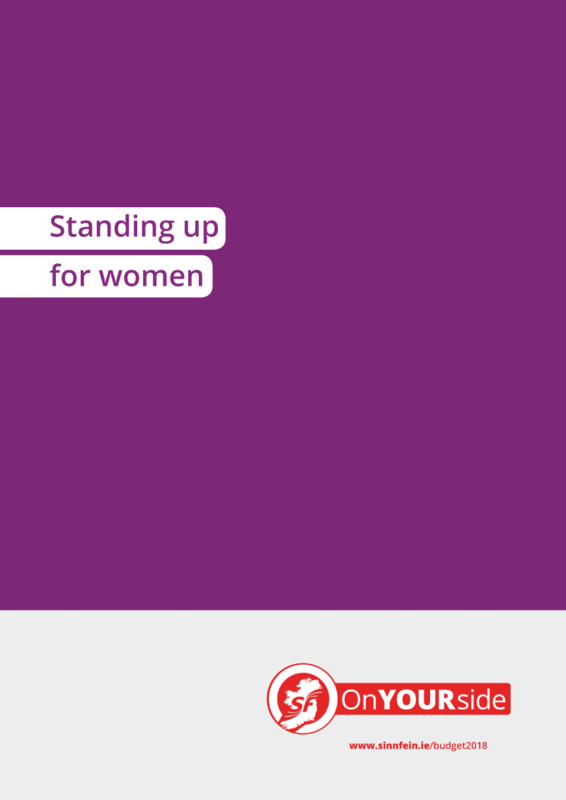 We also support the NWCI’s recommendation that training and capacity building on gender equality and gender budgeting within the civil and public service be adequately resourced. Education has suffered hugely as a result of significant underinvestment and harsh cutbacks in recent years. Supports for children with special needs have been cut, minimising their time with Special Needs Assistants and Resource Teachers. Student fees have been increased and grant supports have been cut, meaning that many third-level students have had to leave their courses. Students are being taught in overcrowded classrooms while school principals struggle to cover the basic costs of running a school. Increasingly, the costs of ‘free education’ are being passed on to parents and are presenting a real burden to children of lower- and middle-income households. Cuts in Guidance Counselling provision have further affected the least well off. Sinn Féin’s proposals for Budget 2018 aim to tackle the underinvestment in our education system, to create more equal access to education while establishing a firm foundation for our State to compete on the international stage through a well-resourced public education system. Figures provided by the Department of Education show that almost two thirds of all mainstream primary school pupils are currently being taught in classrooms of 25 or more pupils, while the average class size in Europe is 21. The cuts imposed by successive governments have resulted in an 11% reduction in the overall capitation paid to schools. Parents are increasingly pressured to make up the shortfall through ‘voluntary contributions’, while principals struggle to pay for essential services such as lighting, heat, and insurance. Cuts to guidance counselling have meant that there has been an overall reduction of 27.6% in the provision of the service since 2012, when the cuts were introduced. The ESRI has found that this cut has impacted those from disadvantaged backgrounds disproportionately. Sinn Féin is committed to fully restoring this service on the basis of 1 guidance counsellor per 500 pupils outside of the existing pupil-teacher ratio. Over 500 schools have appealed their allocation of resource teachers under the new allocation model. This model is not sufficiently flexible to allow schools to provide resources to children when their needs are identified after the allocation has been made. Sinn Féin would hire 450 additional resource teachers to help ensure children receive sufficient support during the transition to the full implementation of the new resource model and make funding available to hire an additional 500 SNAs in 2018. Recent figures from the Department of Education show how that the ratio of psychologists has declined since 2012 and the capacity of the service appears to be limited to an average rate of assessment or referral to the service of just over 2 pupils per school per year. This measure, which increases NEPS funding by 25%, would allow for the recruitment of additional psychologists and the provision of administrative support to enhance capacity. This measure would reverse the changes to the staffing schedule for schools with less than 86 pupils and help to protect small rural schools as well as gaelscoileanna and minority schools that have been adversely impacted by these measures. Funding for the school completion programme has declined since 2010, despite the fact that the school completion rates in DEIS schools is lower than the national average by 8 points. Sinn Féin proposes the immediate restoration of funding for this programme to give young disadvantaged students the supports they need to complete secondary education at the same rate as their peers. Between 2008 and 2014, there has been a €14 million reduction in funding for school transport and new rules make it harder for children to access this service. Sinn Féin is providing an initial funding increase of €7 million in order to provide for a more accessible, flexible school transport system. The Cassells Report laid bare the extent to which higher-level education has been underfunded, jeopardising the education of our students and potential economic growth as a result. Sinn Féin is committed to increasing investment in higher and further education. The current student-to-staff ratio in Institutes of Technology stands at 23:1 well over the OECD average of 16:1. Institutes of Technology currently have the highest rates of non- progression and the high student-to-staff ratio has contributed to this. As an immediate measure, we would reduce it by 1 point. Since 2008, the core funding to Higher Education Institutions has dropped by 20% per student and there is now a funding crisis in our higher education system. As an immediate measure, Sinn Féin proposes to provide an increase of €9.6 million for the core grant funding to HEA institutions, with a plan to increase the overall funding by 20% over a ten- year period. Hikes in the Student Contribution Charge are putting undue hardship on many families, effectively pricing some out of education. The economic, employment and research impact of higher education is to the benefit of the whole of society, not just students and graduates. Increased rents, fees, and travel costs with reduced supports have meant that many students experience financial hardship. A recent survey by the Union of Students in Ireland states that many students have to skip meals in order to manage the costs of further education. The introduction of pro-rata fees for PLC courses has added a significant financial burden on young people seeking further education. Given the relative lack of funding support available for these programmes, Sinn Féin believes these fees to be unfair. The Momentum Programme funds the provision of free education and training projects to allow jobseekers to gain skills and to access work opportunities in identified growing sectors. However, young people with disabilities are excluded from participating. We would fund an initial additional 500 Momentum places for young recipients of Disability Allowance. Sinn Féin would increase Current spending in Housing by €44 million to address issues including homelessness, housing supports for people experiencing domestic violence, housing access for people with disabilities and improved fire safety regulations. Sinn Féin’s major capital investment programme for the delivery of social and affordable homes is outlined in this document in ‘Capital Investment Plan - Fighting Brexit’. This fund would be used in part to roll out a Quality Standards Framework for all homeless emergency accommodation and an independent inspection regime. The remainder of the allocation would be held as a contingency fund to meet day to day requirements of providing emergency accommodation. Increase funding for domestic violence refuge and step-down support services to €60m by 2021 with a budget increase for 2018 of €9.4 million bringing the total allocation to €31.5 million. Increase the central government allocation to local authority disability and mobility adaptation grants for council tenants and private home owners by 50% at a cost of €23.92 million. Create a fire safety risk inspection team to work in local authorities at a cost of €829,000. This would ensure that all new multiple occupancy residential developments are subject to mandatory local authority fire safety inspections. There is a childcare crisis in this State which is placing an increasing financial burden on parents who want to access affordable and high-quality childcare. While these costs for parents continue to increase, childcare workers are seeing little in terms of pay rises and are trying to maintain high standards under increasingly difficult working conditions. Childcare workers play a vital role in society yet the current average wage in the sector is only €10.79 per-hour. That is simply not reflective of the importance of the work they do. The current situation is becoming unsustainable and that is why Sinn Féin wants to introduce a series of measures in Budget 2018 to alleviate the childcare crisis, bring costs down for parents and increase pay for workers in the sector. The provision of wider supports to families and ensuring child protection is also of the utmost importance. That is why Sinn Féin is proposing an increase in the number of Social Workers, Aftercare Workers and Family Resource Centres in the State. Sinn Féin also proposes the creation of an Office of the Digital Safety Commissioner. This would include a children’s Cyber Safety Strategy that would focus on education when it comes to online behaviour. Sinn Féin is proposing a significant €2 per hour increase to the Universal Childcare Subsidy for children aged from 6 months up to 3 years old, this would result in a new rate of €2.50 per hour for 2018. Parental fees would be reduced by €420 per month per child in full-time childcare. Meaning that the average crèche fees paid by parents of children aged between 6 months and 3 years old would be more than halved. Future Budgets must continue to increase and expand investment until we arrive at a point of universal childcare provision. Early Years providers’ duties involve a large portion of administration and non-contact work in order to successfully deliver childcare schemes. Much of these duties are performed outside of the standard working day. Budget 2017 provided payment for the equivalent of seven days of non-contact time. Sinn Féin recognises that seven days is still too little to allow for the vital administration work that must be done to be completed. Therefore, Sinn Féin is proposing a 25% increase to non-contact time payments. 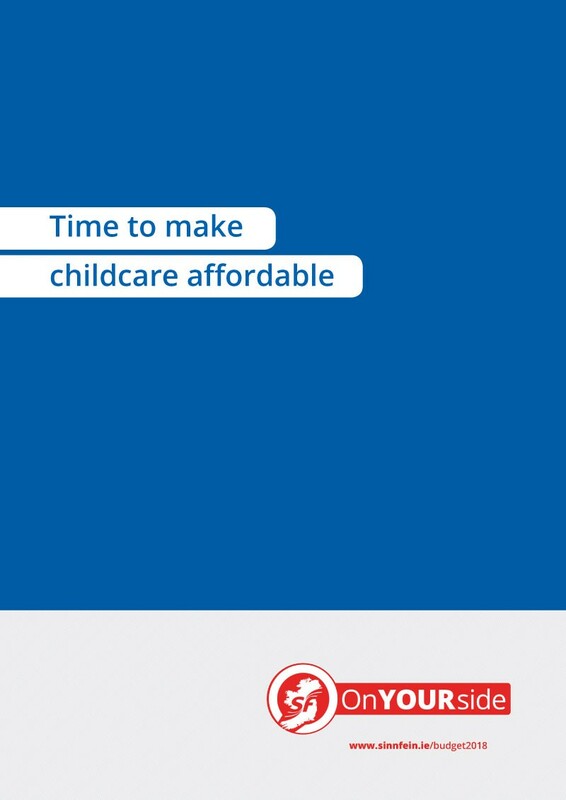 The increase in non-contact time payment will apply to all government-subsidised childcare schemes. Wages and working conditions in the early years sector are unacceptably low and this needs to change. Staff in the sector are doing their very best to maintain high standards under increasingly difficult circumstances. 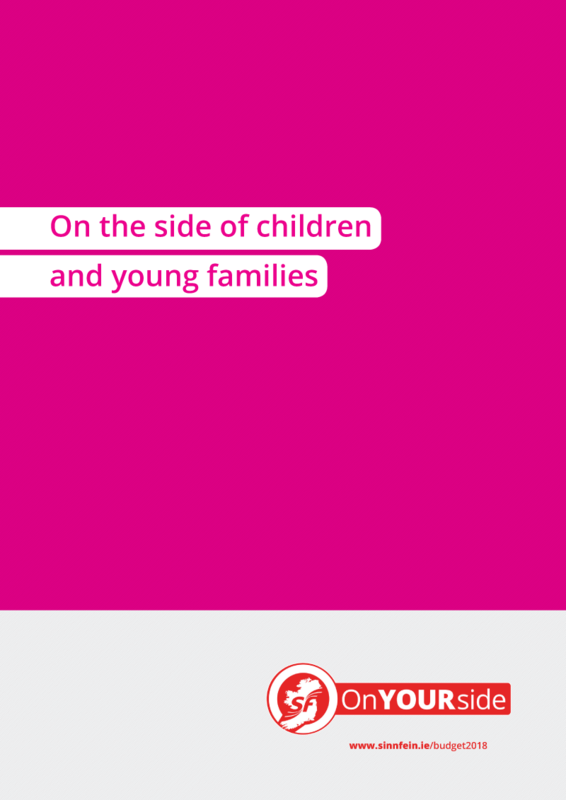 At €10.79, average pay in the childcare sector is almost €1 short of the Living Wage which is €11.70. Sinn Féin is proposing that a fund of €40.58 million be allocated by Budget 2018 in anticipation of a much-needed sector wide pay agreement. A fund of this size would allow for the introduction of a pay increase of, on average, €1 per hour for childcare workers or €2,000 per annum for those working full time. This must be a first step towards a situation where every childcare worker is paid at least the Living Wage and those with higher qualifications and responsibilities are more appropriately remunerated. As it stands, the free pre-school year (ECCE) contract means that many service providers operate at a loss with staff forced to sign onto the dole during the summer months. By extending the programme by two weeks as an initial measure, we can help contribute towards childcare costs for parents during the summer period and help ease the financial burden faced by staff in the sector. The National Quality Framework for Early Childhood Education curriculum should be rolled out through the County Childcare Committees (CCCs). This would ensure national coverage with minimum cost, since the CCCs have access to all childcare providers nationally, are linked to local training agencies and are supporting the administration of the Learner Fund. It has been estimated that completing the full national roll-out of the Aistear curriculum framework and Síolta quality framework would cost an additional €1.6 million. In 2018 Sinn Féin propose to allocate an additional €0.5 million to further this important work. Capitation rates are paid by the State to crèches and pre-schools for each child participating in the ECCE programme. A higher capitation grant is paid where the education and care is led by a Level 7 graduate, a reflection of the quality provided in the crèche. However, the rates are inadequate and providers have begun to request ‘voluntary’ contributions from parents to make up the deficit. Sinn Féin proposes increasing both the higher and lower capitation grants by €5 per-child, per-week. Sinn Féin will provide a Sustainability Fund for childcare providers to the tune of €3 million. This fund will help ensure that new regulations do not negatively impact on service provision. The Sustainability Fund will aid providers to recruit and retain qualified staff, ensure all children are cared for by a qualified worker and allow service providers to move into a position where they can be sustainable in the long term. There are currently 106 Family Resource Centres (FRC) and 2 Outreach Centres operating throughout the State. The FRC programme acts as a first step to community participation and social inclusion through involving local communities in tackling the problems they face, and creating successful partnerships between voluntary and statutory agencies at community level. Sinn Féin would open an additional 10 FRCs. Recent reports from HIQA into foster services across the State have shown that social workers are under intense pressure when it comes to the sheer volume of reviews and reports which they must conduct. In order to help relieve this pressure, more social workers are needed. This will help see that care plans are regularly reviewed and foster parents are regularly assessed. Sinn Féin proposes to hire an extra 150 social workers in Budget 2018. All young people who have had a care history with Tusla are entitled to an Aftercare Service. These services are provided on the basis of assessment of need, age and length of time the young person was in care and aim to help these young people to transition from care to adult life. The hiring of 40 additional Aftercare workers will help to increase provision of services and provide more availability of much-needed support services to these young people as they adapt to their new way of life. Cyber-safety is one of the major child protection issues of our time. Access to the internet presents various dangers when it comes to child safety, from access to inappropriate material, cyber-bullying, and predatory behaviour. Sinn Féin would allocate €2.36 million in Budget 2018 because we want to see the establishment of an Office of the Digital Safety Commissioner and a regulatory policy framework. This Office would roll out a National Strategy on Children’s Cyber Safety and include key education measures when it comes to online behaviour. Since 2010, many communities across the state have felt the impact of cutbacks in policing, leaving many isolated and at a greater threat of crime and anti-social behaviour. Garda response times are totally unsatisfactory due to under resourcing on the part of successive Governments. Sinn Féin believes that there is an urgent need for considerable investment in security for our communities and has opted to invest in our Alternative Budget for the year 2018. With this comes the increased use of newer technologies to assist Gardaí in their work, as well as investment in the Office of Director of Corporate Enforcement, allowing the state to tackle white collar crime in a meaningful way. The first effective measure to tackle, reduce and prevent crime is to recruit more Gardaí, allowing for a greater presence in our communities on a day to day basis. With that in mind, Sinn Féin would allocate €18.25 million to recruiting and training 800 Gardaí, which would go some of the way to restoring Garda numbers to pre-crisis levels. Additionally, we would employ 500 new civilian staff, this would free up Garda time to allow them to spend more time on the street, with Gardaí not finding themselves overburdened by paperwork and other administrative requirements. The Office of the Director of Corporate Enforcement has suffered in terms of credibility due to the failure to conduct prosecutions of corporate greed and crime since the economic crash and the mishandling of significant cases. Much of this is due to lack of resources and successive Governments turning a blind eye to corporate crime. Sinn Féin propose a 25% increase in funding to the Office of Director of Corporate Enforcement for 2018 in order to tackle white collar crime in a serious way, for the first time. Fine Gael and Fianna Fáil have had ample opportunity in the past to introduce measures which would show they take such criminality seriously, but have failed to do so. An Garda Síochána has not adequately kept pace with advances in crime fighting technology, leaving ordinary gardaí at a loss. Some of these technologies are cost effective and can be provided easily. The allocated sum above would be broken down into three categories; Satellite Navigation for all Garda vehicles providing for quicker response times, the installation of cameras in each car which would aid in protecting both Gardaí and citizens, and the allocation of a secure encoded USB stick to every Garda in the force for usage by individual Gardaí when compiling evidence. These are basic requirements that should have been put in place long ago. The impact that Garda youth diversion projects have in communities is well documented, seeing significant reductions in crime, as well as improving relations between gardaí and young people in the community. Firefighting has long been the approach to tackling youth crime, especially in more urban areas, where criminal gangs are active and a threat to communities. Sinn Féin is taking a proactive stance on the issue of crime in marginalised areas by creating 10 new focused projects in areas of disadvantage. A model of early intervention and prevention is the best approach, as it targets those identified to be at risk at an earlier stage than current policy and guidelines allow. In this year’s budget, we propose a 5% increase in funding for the Courts Service and the Director of Public Prosecutions. We believe this increase in funding would lead to greater efficiencies within our judicial system and would go some way in clearing the backlogs currently being experienced in particular areas within the system. Criminals must be promptly prosecuted and communities made safer without avoidable delay. Sinn Féin proposes to reduce the minimum contribution required from those availing of free civil legal aid from €130 to €50. Legal aid is a vital service to ensure that those on low incomes are able to access the justice system. It is too difficult to access civil legal aid and the €130 contribution is a significant disincentive to people on very low incomes accessing the legal services they need. Sinn Féin launched a framework document on what an extension of LRA should look like in 2016. It favoured a collective agreement, a reinstatement of certain allowances, collective bargaining rights for members of the defence forces, and a fair and timely unwinding of FEMPI. Sinn Féin are providing for the proposed public sector pay deal that will unwind some of the financial emergency measures legislation over the next three years and improve rates of pay and working hours for those in the public sector. The pay deal currently being voted on by trade unions unwinds most of the FEMPI cuts for those earning less than €70,000 a year. Our position on ratification of the agreement is that this is a matter for the trade union membership and we will provide for the deal, if accepted. Equal Pay for Equal Work: pay increases for post-2011 workers over 3 years to bring them up to the same levels as their co-workers - Cost €69.67 million in 2018. One of the most fundamental issues facing post-2011 recruits to the public sector has been the issue of pay equality. Teachers, gardaí, and nurses have all taken industrial action on this matter and the government has no plan to address this outside of the Lansdowne Road Agreement and the more recently discussed, but not yet adopted, Public Service Stability Agreement 2018-2020. While we recognise that the public sector pay deals are matters for the trade unions and their membership, we also recognise the increases in the cost of living and the legitimate concerns of frontline public sector staff doing the same work for less money and it is not realistic to suggest that this not be addressed until after 2020. Public sector workers have suffered on average a 15% cut in pay. On top of this, new entrants from 1 January 2011 start on a pay scale that is on average 10 % lower than the rest of the workforce. Sinn Féin believes that the public sector needs to return to a single- tier pay system and that a new agreement should achieve equal pay for equal work. Sinn Féin supports the introduction of a living wage as it is a wage which makes possible a minimum acceptable standard of living. The cost of living in Ireland is a serious problem for many workers earning this amount. Major costs such as housing, car insurance, childcare, and transport costs all have a major impact on people on this income. The high levels of rent make it unmanageable for workers on the minimum wage to make ends meet. The Comptroller and Auditor General conducts a vital function promoting the efficient use of resources and minimising wasteful expenditure across departments. Sinn Féin are committed to increasing resources for the Comptroller and Auditor General which reaps dividends for public services and achieves maximum value for public money. Sinn Féin believe that politicians and other well paid public servants must practice as they preach and show how sensible savings can be made to excessive allowances and excessive pay. The following group of measures would save the Irish people €7.6 million. Reduce pay and allowances of TDs, Senators, Minister, Special Advisors, and the Taoiseach. The Irish public currently, with certain exceptions, subsidises 35% of the cost of the Central Bank’s regulation of certain financial service providers. Sinn Féin would take this charge from the Irish public and move the entire cost of regulation of the financial sector onto the industry. This scheme involves real jobs with real pay and terms and conditions. Employers receive a subsidy from the State when they recruit an employee who is long-term unemployed and on the live register. Redirecting Department resources into the promotion of this scheme would result in savings because the subsidy paid to employers is significantly less than the social welfare payments participants would otherwise receive. Placing an additional 5,000 people in employment via the scheme would result in a saving of €29 million. The annual current state subsidy to private schools is €80.2 million. Sinn Féin would withdraw this over five years resulting in a saving of just over €16 million for 2018. In 2017, the effect of years of underinvestment in our public transport infrastructure became apparent during the Bus Éireann strikes, while pay and other issues were raised by other CIÉ companies during the year. In August 2017, it was announced that a private British commercial transport company was awarded the tender to operate 24 routes previously run by Dublin Bus. Additionally, 10% of Bus Éireann routes are currently out to tender. Sinn Féin is completely opposed to this steady move towards the privatisation of our public transport network. We are committed to investing in CIE companies through capital spend and public subvention to ensure that public transport companies continue to effectively serve our citizens across the state, and to improve services in areas which are not catered to adequately. The subvention to CIE, which covers Iarnród Éireann, Bus Éireann and Dublin Bus, has been slashed since 2008. In 2008, the PSO funding was €309 million, and in 2017, it was €263 million. Sinn Féin proposes to increase the subvention to bring us towards comparative subventions in other EU States. This increase would help to expand routes, improve services, make fares more affordable, and assist in resolving industrial disputes. The Local Improvement Scheme is a scheme for carrying out improvement works on eligible private roads that are classed as accommodation roads. The scheme provides grant aid, up to a maximum of 90% of the cost of works and the landowner pays the remainder of the cost of the works, which are carried out by the local authority. The Department of Transport ceased to provide specific allocations to local authorities to fund Local Improvement Schemes. Sinn Féin would provide dedicated funding for these schemes. For 2018, we propose to allocate €12 million. The Rural Transport Programme is a vital service for the rural economy and encourages social inclusion for rural dwellers. The ongoing lack of investment in this crucial service means that many communities do not have adequate transport links to local towns and villages. Sinn Féin will invest in the expansion of the service and the provision of new routes beginning with a 15% increase on the 2017 allocation. A reliable, secure, and constant energy supply on the island is crucial to both quality of life and the economy. We must also be conscious of the effect we are having on the environment and the need to switch over to sustainable energy sources. As a result of government inaction, we are set to face enormous fines arising from failure to meet 2020 EU emissions and renewables targets. Actions must be taken and measures introduced to encourage greater development of renewables and to begin the push away from our reliance on fossil fuel imports. We have seen a minimal growth in the use of electric vehicles in the State, with only 1,946 sold under the States grant scheme. Further incentivising the purchase of electric vehicles will help to reduce our transport emissions. Sinn Féin propose to increase the grant support currently available for electric vehicles by €1,000 for each band in the current scheme. This will result in grants of up to €6,000 for the purchase of BEVs. Wider action including the expansion of the necessary infrastructure and sustainable electricity sources will also be vital in the years ahead. Our energy costs are amongst the most expensive in Europe for householders. Far too many people are living in fuel poverty and those living in poorly insulated homes are especially vulnerable. We propose to increase funding to the Warmer Homes Scheme with a view to gradually phasing out single pane windows in homes across the State. Microgeneration has been largely neglected by successive governments. Sinn Féin believe that it should form an important part of our effort to reduce greenhouse gas emissions as well as expanding our use of indigenous energy. This pilot scheme will allow for 200 participants to engage in microgeneration. Households that produce more of their own energy can lower their weekly bills and reduce their fossil fuel consumption. Sinn Féin would seek to grow this scheme in the years ahead. We propose to double the grant available to support householders to install solar heating systems. This will help to reduce our dependence on fossil fuels and our carbon emissions. Roll out the first phase of a domestic bin waver scheme at a cost of €19 million by providing an annual €100 grant to the 90,000 people with medical incontinence and to the 100,000 lowest income households in the state. The rise in the number of people back in work is most welcome, but Sinn Féin seeks to ensure that all workers in the labour force are treated justly and paid fairly. In 2017, 35% of all employees across the state are earning below €400 per week. These people, who get up early in the morning, deserve more than to be constantly living on the breadline. At the midpoint of this year, there were 32,237 people under 25 signing onto the live register. Our apprenticeship policy aims to provide these young people with the educational and training opportunities needed to start and build a successful career. Brexit will bring specific challenges not just to exporters and businesses directly exposed to the British market, but also to many firms and employees further down the supply chain. In this Budget, we have provided funding to address the many challenges SMEs will face in 2018. In the first of our five-year apprenticeship strategy, we would allocate funding to increase the number of people in the apprenticeship system by 5,816 bringing it to a total of 21,000 and provide funding for the development of 13 new apprenticeship programmes. These changes will focus on increasing the number of female apprentices, and making apprenticeship learning and training more accessible to people with disabilities. Other changes will include greater involvement of trade unions, abolition of apprenticeship fees and a better integration of the apprenticeship system in the wider third level sector. With 98% of businesses surveyed by InterTradeIreland still without a Brexit plan in place, this funding is aimed at those SMEs and farming enterprises that are in need of Brexit support funds. Some SMEs and farmers, who are not directly exporting, are not yet aware of the impact Brexit could have on their business. This funding will allow these enterprises to investigate their level of exposure to Brexit and examine the feasibility of diversifying into different markets or products or adapting their supply chains. State agencies (Enterprise Ireland and Bord Bia) must be provided additional resources to expand current programmes to provide all required assistance to our SMEs, including those in the Agri-business sector. The WALK PEER programme is an example of a positive pilot programme encapsulating all that the Comprehensive Employment Strategy for People with Disabilities is supposed to be about. WALK PEER supports young people on disability allowance to move into paid positions of employment in the open labour market and further education or training in mainstream settings. We want to ensure the positive working concepts developed by WALK PEER continue and are replicated by others. To that end, we propose €1.2 million should be allocated for 2018. A further €2.65 million should be invested via the EmployAbility Service to support an additional 1,000 people with disabilities to attain employment. Learning from positive pilots like WALK PEER should be incorporated into the EmployAbility Service and its working models adapted accordingly. Sinn Féin will allocate €1.5 million in funding for Ireland to join CERN, the European body involved in research in the area of particle physics and quantum mechanics. Ireland is the only Western European country that is not currently a member of this prestigious research organisation. This funding would allow Ireland join as an Associate Member, with the ultimate aim of being full members. CERN is an International Research Organisation, most famous for being the home of The Large Hadron Collider - the world’s largest particle accelerator where the Higgs Boson was discovered in 2012. Also, the World Wide Web was invented at CERN in 1989. Membership would emphasise Ireland’s commitment to science and also could deliver significant benefits in the areas of research and development, technology, education, training, jobs, and procurement. Sinn Féin wants to establish a Cooperative Development Unit aimed at co-ordinating and establishing worker co-ops across Ireland, giving workers the opportunity to own and run the businesses they work for. This unit would provide support and technical assistance to harness the collective entrepreneurship that exists within the Workers Cooperative Network. It would also assist in the establishment of new worker co-ops through advice and networking. We are allocating an additional €1 million to Science Foundation Ireland to pursue Brexit related opportunities in the research and innovation field. Brexit will result in many leading scientists, researchers and students looking for alternative research and educational institutions where they can continue to access EU funding and research programmes. This allocation will give SFI the resources to attract these world class researchers who could have a substantial impact on Ireland’s research and innovation capabilities. Sinn Féin is supports the living wage, which currently stands at €11.70 per hour. In government, we have pledged to introduce the living wage. Concerted efforts must be made to close the gap between the current minimum wage and the living wage. The Low Pay Commission’s recommendation of a 3% rise for the 2018 minimum wage, amounting to an increase of €0.30 per hour, is unacceptable. In Budget 2018, Sinn Féin believes the government should bring the current minimum wage up to at least €10 per hour, and commit to introducing the living wage. Introducing a living wage will have a number of beneficial impacts. First and foremost, workers and their families will enjoy greater financial security and a better standard of living. Also, people will have more disposable income, resulting in greater consumer spending which would benefit local businesses. Increasing the minimum wage will also help address the unacceptable gender pay gap that exits in Ireland, as 2 out of every 3 workers who earn the minimum wage are female. Rural Ireland was damaged in the recent past by neglectful, regressive government policy and must be repaired and nurtured to return to being a sustainable place to live and work, where quality of life is matched by quality of public services and where young graduates are attracted to build their futures and returning emigrants can make a living and a home. This measure seeks to increase the current number on the scheme by 500. The scheme is beneficial to rural communities and to job seekers alike and is far preferable to the JobPath type of scheme, the implementation of which has created problems filling places in the RSS. This must be addressed. Funding for resources must be increased while the tragedy of farm deaths continues at an alarming rate, including the deaths of children on farms. For this reason, Sinn Féin would increase funding for farm safety promotion and prevention. The Beef Data Genomics Programme not only aims to improve the quality of the national herd, but is also a form of support which is vital to the sector. Sinn Féin are proposing an additional suckler cow support payment of €40 per cow for year and in the coming years Sinn Féin would bring the payment up to €200 per cow. The Sheep Welfare Scheme should be increased by €10 million so that payment per ewe could rise by €5. Sheep farmers are often those who deal with the most serious natural constraints on peripheral and hilly land and must be supported to continue farming in those circumstances. Irish fish should be promoted in Europe on the same basis as quality food, making use of the reputation of Ireland and the Atlantic waters in which our fleet operates. Farmers and their spouses who have a separate source of self-employed income are excluded from income averaging. Sinn Féin propose to remove this discrimination and remove the current restrictions on eligibility for income averaging where the farmer and/ or spouse has separate self-employed income. Sinn Féin proposes targeting money from underspend within the Department with the aim of reaching €25 million to restore rates to pre-2008 levels. We are aware that the forthcoming review of this scheme may change the payment schemes attached to it, but we are committed to ensuring that those farming in areas of most constraint will continue to be supported. This cost is currently adequately covered by DAFM underspend in areas such as GLAS, TAMS, and Beef Data Genomics Programme. The DAFM underspend was over €80 million in 2016. The horticulture industry is in decline with fewer new entrants and many leaving the sector. The under-resourced Horticulture Industry Forum should be funded to provide support and advocacy and to include the important sectors of potatoes and mushrooms. Policy development at national level needs industry input and the area of succession and encouragement of new entrants is vital. 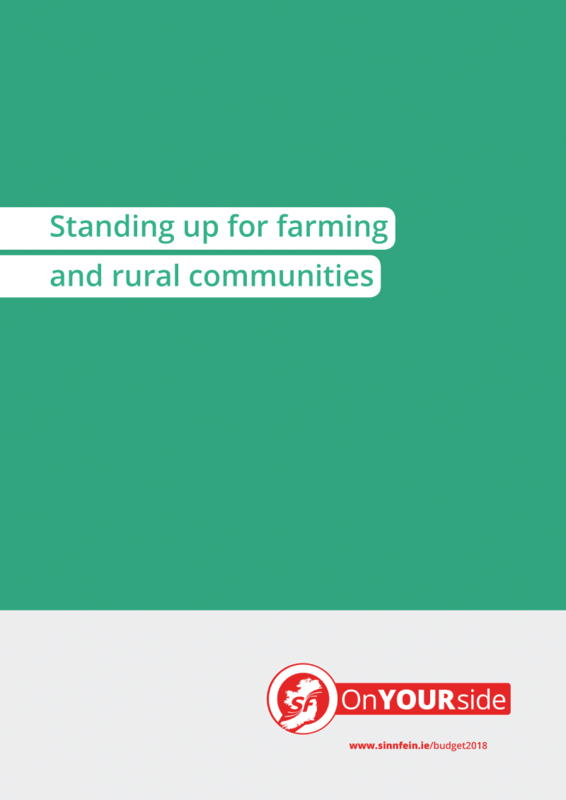 The Action Plan on Rural Development proposes that specific research be undertaken to identify the impact of Brexit on rural areas, particularly in the border region. To date, this research has not commenced. Sinn Féin believes that it is critical that this project commence without further delay so that a clear understanding of the challenges presented by Brexit to farming and rural communities can be achieved and plans put in place to mitigate negative consequences. This allocation is to invest in inland fisheries trout hatcheries to protect the ecology of our rivers and lakes and to provide stock to our vital angling industry which is worth over €750 million annually in tourism. Government plans last year to close hatcheries were met with alarm by anglers all over the state and the change of heart on the issue must be met with funding to continue this valuable function of Inland Fisheries Ireland. Over some years, farmers have presented anecdotal evidence of price fixing in the beef industry. This measure is an attempt, within consumer rights structures, to provide resources to examine and monitor prices and move towards controlling the practice if it is found to exist. Sinn Féin are proposing targeted measure to redress the balance caused by huge cuts in funding by successive governments to rural areas including the Gaeltacht regions. Any commitment to balanced regional development was utterly torn apart by present and past governments with regional areas suffering huge losses in terms of infrastructure, services and community funding. The Irish language has suffered huge losses in funding with significant capital cuts to the budgets of key organisations with responsibility for language promotion and the economic development of Gaeltacht areas. Sinn Féin is stridently supportive of the need to restore Irish as a living language throughout Ireland. We are committed to the implementation of Acht na Gaeilge in the north, and the Official Languages (Amendment) Bill in the south. We are committed to increasing the slashed budgets of our language organisations, securing the economic viability of our Gaeltacht regions, assisting in the provision of greater access to Irish- medium education and strengthening the rights of Irish language speakers nationwide. LEADER has been pivotal in providing rural communities the resources to develop their local areas since its launch in 1991. The aim of this funding, which is matched by EU funding, is to promote social inclusion, poverty reduction and economic development in rural areas. Sinn Féin would ensure that the Exchequer makes up the shortfall to cuts in LEADER funding at EU level, beginning with a €10 million increase in funding in 2018. Local Community Development Projects were once a vibrant, community-based network providing essential supports to many of the most deprived communities across the State. Successive governments undermined the CDPs with funding cuts and mergers into Local Partnerships. Sinn Féin believes that CDPs should be revived through restoration of their funding and independence to enable them to continue their work to empower local communities. In 2018, we would commence a five-year programme of funding restoration, starting with an initial expenditure of €5 million. There is no immersive teacher training course through Irish in the 26 counties. This means that student teachers are not getting the full benefits of an Irish medium education in third level. This is a particular disadvantage for those teaching in Gaeltacht regions, gaelscoileanna with an emphasis on immersive language learning. Sinn Féin would invest €1.3 million into the establishment of an immersive Irish teacher training facility. Sinn Féin supports the plan co-ordinated by Conradh na Gaeilge calling for additional funding for the Irish language and the Gaeltacht. This investment plan covers over 80 Irish- language and Gaeltacht groups including Foras na Gaeilge and Údarás na Gaeilge. We are proposing increased funding of €5.107 million for the delivery of the first year of this three- year investment plan. Údarás na Gaeltachta have a crucial role for the economic, social and cultural development of the Gaeltacht. The authority has employed a wide range of enterprise development and job creation initiatives and is instrumental in supporting strategic language, cultural and community based activities. Despite the significant positive economic impact Údarás has had on Gaeltacht regions, funding for the body was slashed by Fine Gael and Fianna Fáil governments. We would increase funding by €5 million, supporting the industrial, community, and language planning responsibilities that fall under Údarás. The bursary for pupils to attend a summer Gaeltacht course is modelled on the success of the Líofa scheme in the north. Sinn Féin wants to see access to Irish language courses open to all students regardless of social background. The scheme would be administered by the Department of Education in conjunction with the Department of Arts, Heritage, and the Gaeltacht. Sinn Féin recognises the importance of the implementation of the Policy on Gaeltacht Education strategy and that additional funding is vital if it is to be a success. While the government are committing €1 million for the policy, Sinn Féin propose investing an additional €2 million to ensure that vital supplementary resources and trained teachers will be available. The 20-Year Strategy for the Irish language was published in 2010 with the aim of increasing the use and knowledge of Irish as a community language. Since its publication, the organisations responsible for the implementation of the strategy, chiefly Údarás na Gaeltachta and Foras na Gaeilge have had their funding severely cut, while their responsibilities have increased. With language planning, which is crucial for the future viability of Gaeltacht regions underway, additional funding is badly needed. We propose an additional €4 million to support this vital language planning. Sinn Féin is committed to developing a world-class industry from the ground up. We recognise the importance of bringing more voices into discourse and practice, recognising the true diversity of the arts. The transformative effect of cultural activity to the individual, and to society must be given greater recognition as our economy recovers. No citizen can go about their day without engaging with the arts. Fine Gael at the helm of the state’s cultural policy has decimated the sector and, as a direct consequence, the profession of an artist. The Arts Council is the Government agency for funding, developing and promoting the arts in this state. Sinn Féin would increase funding to the Arts Council by €6.5 million in2018. The arts support almost 21,000 jobs while 3,500 artists seek support from the Arts Council to promote and foster creativity. Public investment in the arts directly impacts on employment and ensures a sustainable dividend for the state. Culture Ireland promotes Irish arts across the globe, and financially supports Irish artists and organisations presenting works at venues and festivals abroad including the Edinburgh festivals and Venice Biennales. These projects also make contributions to developing and promoting our cultural tourism offering, benefiting the domestic and foreign tourist. Sinn Féin’s proposal for 2018 is an increase of €0.5m and a return to 2010/2011 funding figures. The National Cultural Institutions have faced cuts in excess of 40% and are struggling under funding circumstances that create a cultural atmosphere that is inert rather than dynamic. Day to day operations, opening hours, staffing numbers and programming have all been affected within these institutions, many of which are amongst the top 10 most visited attractions in Ireland. Sinn Féin will safeguard the right of every young person to explore their artistic and creative potential. Over the course of a Government term, Sinn Féin will develop and deliver a National Youth Arts Strategy promoting participation, progression and provision. A three-year implementation programme at a cost of €5 million will follow the initial two- year research, planning and consultation phase with no cost to the exchequer. We are living through a period of deep instability internationally. An unprecedented number of refugees, climate change, imperialism, war, poverty, and inequality are all issues that Ireland must tackle. While Sinn Féin’s priority will always be creating a genuine and inclusive republic for all on this island, we will never be blind and ignorant to injustice abroad. Irish people should be rightly proud of the Irish Aid programme and its international acclaim. Sinn Féin is proposing an €5 million increase in funding for ODA. The UN target of 0.7% of GNI for aid spending must be a foreign affairs priority. However, ODA is not a tap that can be turned on and off. There needs to be proactive consultation with relevant stakeholders, and short, medium, and long term projects and targets, rather than simple yearly targets. One of the major challenges the country faces is the consequences of nearly a decade of underfunding of capital infrastructure. In light of Brexit this investment is all the more critical. Small scale schemes targeted at this group or that group have a part to play in tackling the impact of Brexit but the most important commitment the government can make is to commit to a radical, ambitious and thought out Capital Plan. The 2016 Global Competitiveness Report ranked “inadequate supply of infrastructure” as the most problematic factor for doing business in Ireland. We cannot face the challenge of Brexit starting with such a handicap. We have the fastest growing population in Europe and we will continue to do so for the coming decades as the population of the island approaches 10 million by the middle of the century. Yet, we have one of the lowest levels of capital investment in Europe and successive EU Commission reports have highlighted infrastructural deficiencies as a threat to long term growth. The Governments capital investment plan puts capital investment at just 2.16% of GNP for 2018; this is shockingly low capital investment and is both reckless and unsustainable. It will also ensure that our capital investment remains one of the lowest in the EU. Sinn Féin’s Capital Investment Plan - “Fighting Brexit”- would increase capital spend by €1.65 billion euro above the government’s plans, resulting in a rate of capital investment to GNP of 2.84%. Spin and announcements won’t see off the challenge of Brexit but a well- planned and ambitious Capital Plan will give us the boost the economy needs. Now is the time to invest in our infrastructure, with the myriad of crises we face from the lack of capital investment and the dark clouds of Brexit looming large. Sinn Féin believes that access to affordable, stable and adequate housing should be a right. It is the responsibility of Government to ensure a functioning housing system that meets the accommodation needs of all. The current housing crisis is due to decades of over reliance on the private sector to meet social and affordable housing need; an underinvestment in public housing; weak regulation of the private rental sector and; failure to address housing disadvantage for excluded or marginalised sections of society. The Government claims that it will meet the ‘social housing needs’ of 21,050 households in 2017. But only 4450 households will have their needs met through real social housing (new build, acquisitions and refurbs by local authorities and approved housing bodies). The remaining 16,600 households are to be accommodated in leased private sector properties, the vast majority for just two years under the Housing Assistance Programme, leaving them insecure. Meanwhile, the Government has not delivered a single affordable rental or purchase unit in 2016 or 2017. Any government that wants to address the housing crises must dramatically increase capital investment in good quality, well planned and serviced social and affordable housing. In 2018, Sinn Féin would ensure an investment of €1.918 billion in social and affordable homes by increasing the Governments capital plan commitment of €788 million with an additional €1.13 billion. €1.49 billion of the total would be invested to deliver 10,000 real social houses, owned by local authorities and approved housing bodies. The remaining €428 million would be invested to kick start a new affordable housing programme that would deliver 2,000 affordable rental and 2,500 affordable purchase homes. These affordable homes would be made available to households who are struggling to meet the cost of rents in the private market or to purchase a home but whose incomes exclude them from social housing. Sinn Féin would deliver 4,131 social homes in addition to the Government’s 2018 target of 5,869 with an increased capital allocation of €702 million on top of the Government’s proposed €788 million. This would allow for the delivery of 10,000 social homes. We propose to give an additional €378 million to local authorities in 2018 to build 2,000 extra Council homes. We propose to make a further €223 million available to local authorities to purchase 1,311 homes from vacant and abandoned private housing stock. The local authorities would deliver these homes using a larger Buy and Renew Scheme. The Housing Agency have a fund which acquires vacant private housing stock that is not on the open market in order to deliver social homes. We are also proposing to double this fund in 2018 at a cost of €70 million. This would fund the delivery of an additional 420 Council homes. Finally, we propose to restore funding for Traveller Accommodation Programmes to its 2008 levels by increasing the budget by €31 million in order to deliver 400 traveller specific family units. In the past, Councils have failed to spend their budgets for traveller accommodation with devastating consequences. To ensure that these funds are spent, Sinn Féin would give the Minister of Housing new powers to ensure that all funding allocated to local authorities for their traveller accommodation programmes is drawn down and spent within the allocated year. Sinn Féin are also proposing that a new affordable housing programme be introduced commencing with 4,500 homes in Budget 2018. These homes, which would be built on public land would be made available to single income households earning less than €58,000 and to joint income households earning less than €75,000 gross. This novel programme has the potential to be both an effective supply side intervention in the housing market and to deliver greater social mix in our housing developments. We propose to allocate an additional €378 million to local authorities so that they can build 2,000 affordable units which they would then rent to qualifying households. The rent levels would be set at the economic cost of delivering and maintaining the unit and index linked to the consumer price index rather than based on market prices. In addition, we propose to allocate €50 million to Councils so that they can work with not-for-profit housing providers to build 2,500 affordable housing units which would be purchased by qualifying households. This €50 million would cover site development costs on public land. The model for the development of the units would be based on the Poppintree Ó Cualann development in Ballymun. The remaining revenue required to build these homes would come from private finance secured by the not-for profit housing agency for construction and from the mortgage secured by the purchaser. In addition to funding the site servicing costs the Council would waive development levies and commercial land costs allowing the houses to be sold at prices ranging from €170,000 to €260,000, depending on the accommodation size and type. Sinn Féin remains committed to increasing capital investment in the state’s water and sanitation system. This is essential if Government is to address issues of quality and reduce wastage in the domestic water supply and to address the very serious deficiencies in our waste water treatment system. Sinn Féin would increase capital investment in water and sanitation by €100 million in 2018. Sinn Féin would ensure that this additional investment would be targeted at addressing those waste water treatment plants currently in breach of the Urban Waste Water Directive, for which the Government is currently in front of the European Court of Justice. We would also seek to target additional investment in front loading the upgrading of outdated pipe infrastructure in order to avoid critical losses of supply such as occurred in Louth this year. The capital investment in health proposed by the government in ‘Building on Recovery: Infrastructure and Capital Investment 2016 - 2021’ is grossly insufficient. Between 2008 and 2013, public capital expenditure on health was cut by 45%. Under the government’s plan, capital investment in health will fail to recover to its 2008 level by 2021. It has been estimated that 75% of the Capital Allocation for Health through to 2021 will be needed for just five major projects. However, further capital investment will also be needed to cope with demographic changes and moving the health service from secondary care dependency to a primary care focus. Furthermore, funding is also overdue and badly needed for ICT (e-health strategy), diagnostics (including in primary and community care settings), as well as equipment. For Budget 2018, Sinn Féin proposes an additional €100 million in capital investment in our health system above that proposed by the current government. Substantial capital investment is required to ensure equal access for all citizens to relevant education throughout their lives. Sustained funding is crucial in order to reduce class sizes and significant modernisation of our third level educational facilities is necessary to guarantee the sector compares well internationally while encouraging greater future participation in lifelong learning. Sinn Féin will provide significant additional investment for the construction of new primary and secondary schools to tackle the critical issue of excessive class sizes. Sinn Féin will allocate focused funding for the practical requirements of Junior and Leaving Cert reform specifications - in particular for IT and necessary equipment for science and practical subjects. The government has committed to replacing all prefabs with permanent accommodation under the Programme for Government but this will not commence until 2019. Sinn Féin proposes an initial outlay in year one of €10 million to allow this to proceed immediately. Sinn Féin will invest in wireless connections to schools and establish a grant for schools to apply for funding to purchase or maintain IT equipment in order to implement the digital strategy as a matter of priority. Sinn Féin are proposing an increase in funding to schools to complete necessary and immediate works over the summer month period. Sinn Féin will provide additional funding for the minor works grant and equipment renewal for third level Education institutions. Sport is hugely beneficial to communities across the state and Sinn Féin recognises the importance of sport in our society. Sport benefits our mental and physical health, inspires confidence in our young people and supports community and inclusion. In 2017, an unprecedented number of sports groups and clubs applied for Sports Capital Programme grants, as no grant was available in 2016 and the grant was not annualised until this year. Many of these groups had their applications for Sports Capital Grants turned down due to the demand. Sinn Féin propose to increase the funding available for the Sports Capital Programme by €4 million. The benefits arising from investment in Arts, Heritage, and the Gaeltacht cannot be understated. Not only does the cultural quality of life and the strength of our national language increase, there are many other benefits which manifest in terms of increased tourism and job creation. Our people prosper from increased funding in this area, and so too does the economy. Sinn Féin’s capital project for the development of an ‘Artist Spaces Scheme’ seeks to develop state owned cultural infrastructure that offers security of tenure to artists in settings across the state. Sinn Féin believe that designers, musicians, visual artists, web developers, and performers can be insulated from the commercial rental market. We are proposing a fund of €5 million, which would provide a number of local authorities with the opportunity to repurpose and refurbish existing buildings. Preserving our heritage and history is vital in contributing to the quality of life and cultural identity of our communities. Moore Street is one such site which is of tremendous importance in the birth of the Irish State, and which is deserving of sufficient funding to ensure its restoration and further development as a key historical site and prime cultural asset. Our language is also vital yet there is no Irish language centre in the South of Ireland. Sinn Féin are proposing the establishment of a Cultúrlann in Dublin City Centre so as to establish a shared civic space for Irish speakers of all ages. With few opportunities for people to speak Irish when they leave the educational system, a dedicated venue, with a café, theatre, and conference room would create a dynamic, central hub in which the Irish language could thrive. We have proposed that such a centre be located on Moore Street and this project should be furthered in 2018. Our cultural institutions are invaluable to the Irish state in terms of showcasing the finest art, heritage and history that our country has to offer. They are elucidating and informative for both local and tourist alike and continually innovative. Investment in the Irish screen industry provides economic and cultural benefits, far beyond the direct employment of cast and crews. Tourism Ireland estimates that 35% of people visit Ireland as a result of seeing it on screen. The capital allocation below is mainly for the provision of development and production loans to the independent film and television sector. Sinn Féin propose a €2 million increase to its allocation for Budget 2018. Údarás na Gaeltachta are responsible for energising Gaeltacht regions economically by supporting job creation, while promoting the Irish as a community language. Massive funding cuts by Fianna Fáil and Fine Gael to their capital budget has hindered the potential of the body to deliver for the Gaeltacht community. We would increase funding by €5 million in 2018. The Walks Scheme has been a success in terms of its impact on boosting rural, developing recreational activities and supporting farmers who provide access to their land. Sinn Féin propose that the number of walks under the scheme be increased to 80, with a funding allocation of €4 million. Transport infrastructure has suffered from a decade of underinvestment by successive governments, leaving huge infrastructural deficits and allowing existing infrastructure to significantly deteriorate. Sinn Féin will invest in road maintenance, cycle lanes and in our public transport companies to ensure an efficient and well-funded public transport service for all users across the state. This will have benefits for society, for the economy and it will help us to achieve our EU emissions commitments. We need significant investment in regional and local roads to ensure social cohesion and economic growth in rural areas and in towns across the state. Our regional and local road network is slowly disintegrating. The Department of Transport, Tourism and Sport estimated last year that there was a €3 billion backlog in road works on regional and local roads. For too long rural communities have dropped down the priority list. This investment would go some way to addressing that imbalance and giving rural communities across the state roads that are fit for purpose and that will stand the test of time and weather. The Capital allocation to regional and local road grants in 2017 was €280.6 million. Sinn Féin propose to allocate an additional €95 million to bring this figure to €375.6 million for 2018, which is an increase of one third. Our railway networks have been neglected to the point of raising safety concerns, and the National Transport Authority (NTA) estimates that a €500million investment is needed in the next five years to maintain the network. Sinn Féin is committed to investing in rail infrastructure to improve the safety, speed and frequency of rail services to make them more attractive to intending travellers. We are proposing a capital funding increase of €30 million for Iarnród Éireann to begin the process of investment in rail infrastructure for 2018. Infrastructure for cycle lanes must be developed to ensure that cyclists can travel safely. Having sufficient cycle lanes will increase the number of cyclists, in particular those who cycle to work which will reduce car use, improving congestion in towns and cities. Currently, a record 12,000 cyclists a day commute to Dublin City. This is the highest number since records began and yet, the infrastructure developed in recent years does not reflect this trend. Investing in cycle lanes will increase this number further, whilst also tackling traffic gridlock, improving physical and mental health and reducing emissions from motor vehicles. Access to transport is vitally important for people living with disabilities to facilitate social inclusion. Appropriate transport ensures that people with disabilities have access to work, healthcare, other services and social activities. At present, there is a significant divide in access between those living in cities and those in rural areas and towns. Sinn Féin are proposing a 10-year programme to make all public transport services fully wheelchair accessible across the State. The plan will include bus stations, buses and coaches, bus stops, railway stations, taxis and hackneys. Each year many communities have been subject to the devastation of severe flooding. Sinn Féin believes that the level of investment in flood relief and prevention measures is inadequate and would increase the government allocation by 50%. We propose an additional investment of €35 million to bring the total to €105 million for 2018 in order to escalate flood mitigation works. Sinn Féin recognises the value of all-Ireland infrastructure and cooperation. We are determined to ensure that the commitment to the A5 Dublin-Derry road project is delivered on. For that purpose, we propose an additional €10 million be allocated to this project in 2018. In government, we would recommit the entire original £400m, the A5 is a vital piece of All Ireland infrastructure which must be delivered. The Ulster Canal project is another vital piece of all Ireland infrastructure in need of development. It has the potential to transform tourism in Armagh, Tyrone, Cavan, Fermanagh, and Monaghan. Sinn Féin are committed to furthering this project and would allocate €10 million in 2018. The Narrow Water Bridge would link the Cooley Peninsula in County Louth with the Mourne District in County Down benefiting local and cross-border economies and communities. Unfortunately, this project is not expected to reach development stage until after 2018. Sinn Féin remain committed to the development of this project. The Good Friday Agreement established implementation bodies tasked with working on an All-Ireland basis in a range of areas. These organisations work for the interests of all citizens, North and South. Brexit will bring additional challenges to these bodies and their areas of work, and Sinn Féin is committed to supporting them and maintaining this successful All-Ireland approach. InterTradeIreland is the All-Ireland agency with responsibility to boost North-South economic co-operation. InterTradeIreland is a powerful resource for business growth, helping SMEs through a strong mix of business intelligence, funding, support and meaningful contacts. In 2016, cross-border trade was valued at €2.7 billion. The impact of Brexit will have a particular impact on InterTradeIreland clients engaged in cross-border trade, but despite this the agency has its lowest staffing numbers of the past 6 years. In their latest Quarterly Business Monitor, 98% of businesses indicated they have no Brexit plan in place. InterTradeIreland needs more resources and funding to ensure enterprises across Ireland are prepared for all eventualities Brexit may bring, helping to protect trade and jobs. Sinn Féin would increase funding to InterTradeIreland by €1.1 million in 2018. Tourism Ireland is the organisation responsible for marketing the island of Ireland as a holiday and business tourism destination. Tourism is a vital industry for both economies on the island. It is a significant driver of economic growth and helps to support more than 281,000 jobs in communities right across Ireland. Brexit is already impacting negatively on the numbers of tourists arriving here from Britain. Sinn Féin would increase Tourism Ireland’s budget by €6 million in 2018. Waterways Ireland is one of the six North South Implementation Bodies set up under the Good Friday Agreement. It manages, maintains, develops and promotes over 1,000 kilometres of inland navigable waterways, principally for recreational purposes. The waterways under the remit of the body are the Barrow Navigation, the Erne System, the Grand Canal, the Lower Bann, the Royal Canal, the Shannon-Erne Waterway and the Shannon Navigation. Through their development and promotion of inland watercourses, they provide safe, open and accessible public spaces for boating and recreational activities, helping support local businesses and communities across the island. Sinn Féin would increase Waterways Ireland budget by €2.28 million in 2018, this is an increase of 10%. *Foras na Gaeilge features in this document’s section ‘Regional Development and the Irish Language’. A Fully Integrated All-Ireland Economy is not merely a future political aspiration, it is a current economic imperative, and something made all the more urgent as a result of the Brexit referendum. Brexit is already having a seriously negative impact on Ireland’s economy. Sterling has weakened substantially and is making Irish exports into Britain more expensive. The continuing uncertainty due to the chaotic Tory negotiations is making it more difficult for exporters and businesses across Ireland to put Brexit plans in place. The latest Quarterly Business Monitor from InterTradeIreland shows 98% of companies surveyed still have no Brexit plan in place, while 11% of businesses engaged in cross-border trade recorded a reduction in sales. The impact on Ireland’s economy will be significant. In its Assessment of the Economic Impact of Brexit on the EU27 the European Commission outlines that Ireland is expected to lose between 3.4% - 3.7% of its GDP by 2030, even with a Free Trade Agreement in place. In their report on the ‘Potential impact of WTO tariffs on cross-border trade’, InterTradeIreland and the ESRI outlined the effect WTO tariffs and non-tariff barriers post Brexit, such as different licensing, labelling, safety regulations, customs inspections and documentation, could reduce cross border trade by 16% or €432 million on 2016 trade levels. The benefits European Union membership has brought to Ireland is immense, and despite 56% of people in the North voting to remain in the EU, the Tory government is intent on dragging the North down with it. Brexit negotiations have so far contributed numerous slogans and no solutions. Invisible, frictionless and seamless border suggestions have been exposed to be little more than a smokescreen. The bottom line is no border in Ireland is acceptable. Designated Special Status for the North is the only viable solution. Ireland is already heavily integrated across a range of areas and forcing one part of Ireland out of the EU against the democratic wishes of the people is simply not feasible. 2,269 different categories of products are traded North to South. Any imposition of a border will have a serious negative impact on these trade flows. However, it will also have a significant social and physiological impact, something that cannot be quantified in numbers. A large amount of bodies and organisations already operate successfully on an All-Ireland basis. It makes economic and social sense to work together and combine resources for the benefit of all citizens of this island. In economic terms, Tourism Ireland attracts millions of tourists to Ireland each year while InterTradeIreland support SMEs engaged in cross border trade. In sport, the GAA, rugby, boxing, cricket, basketball, hockey, swimming and athletics are all organised on an All-Ireland basis which results in considerable national and international success. In healthcare, the new North-West Cancer Centre at Altnagelvin Hospital is an example of the benefits integrated planning and investment can bring for people’s health. Unfortunately, businesses cannot fully benefit from an All-Ireland approach due to the different tax, legal and currency regimes which exist in each jurisdiction. This results in unnecessary expense and administration, hindering growth. If the North is given Designated Special Status within the EU, this will provide a new opportunity to expand the areas of cooperation and integration for the betterment of all our people. Irish Unity is an approaching reality, and increasing cooperation and integration now will be of greater benefit in the long term. The EU has given assurances that a future United Ireland will continue to be a full member of the European Union. The Modelling Irish Unification study by Professor Kurt Huebner of Vancouver University (2015), estimates that political and economic unification of Ireland could potentially deliver a €35.6 billion boost in GDP for the island in the first eight years. A single, all-Ireland jobs and investment agency would combine and integrate the current efforts of the IDA, InvestNI and InterTradeIreland. Foreign Direct Investment could be attracted on an All-Ireland basis and Ireland could be promoted as an English speaking base with access to the Single European Market and Eurozone. Harmonising the tax and legal regimes in addition to eliminating currency volatility would allow SMEs, who traditionally avoided doing business in the other jurisdiction due to these differences, to expand their reach and market across the whole of Ireland. An integrated agricultural administration on the island would remove obstacles faced by farming communities. In recent years, we have seen issues with country of origin labelling, two jurisdiction tagging systems, and diverging animal health regulations. Post-Brexit, a United Ireland is more important than ever for the Agri-food industry. Unity would mean a single, cohesive voice, better placed to ensure a fair price for produce from meat plants and processors and regulate the power of supermarkets. The state is at a critical point. Workers, families and those who could bear it least were forced to shoulder the burden of a crash they didn’t create. Now the developers and bankers are back demanding that things go back to the way they were, back to laying the ground for another crash. Unfortunately, some politicians are falling for the same old traps. Rather than rebuilding, they want to start destroying again. They want to cut taxes for the wealthiest, while keeping our public services stuck in the austerity age. They have learned nothing. The Fianna Fáil/Fine Gael coalition has delivered chaos in our public services. Sinn Féin’s proposals are about making sure the burden is shared fairly and that the investment needed to give our people world class health, housing, and public services are made. We cannot afford to return to the status quo that brought the crash. A new, modern economy must be built not based on bubbles or on promises that can’t be kept but on sustainable investment. It is time for honesty about taxation and public services. We cannot have a modern progressive economy and services while promising to cut taxes year after year. The reckless agenda of Fine Gael and Fianna Fail is all the more dangerous in light of Brexit and the uncertainty about the USA’s tax policy. Sinn Féin are proposing measures which would sustain long term economic growth and ensure fairness that eases the burden on ordinary families and ends the era of tax avoidance for those at the top. Before the last election, Fine Gael cynically froze the Property Tax. When it is reassessed in 2019, homeowners will face a big increase as the effect of property price increases kick in. The property tax is currently a tax on the family home, a tax on people who are already under pressure financially in so many ways. This measure will save home owners €244 per annum on average. This tax is set to rise dramatically when the temporary freeze on valuation ends in 2019. Sinn Féin will exempt workers earning at or below our proposed minimum wage of €10 per hour from the Universal Social Charge. Sinn Féin would increase the minimum wage by 75c per hour to €10 and, in tandem with this, would proportionately increase the Employee and Employer PRSI bands to ensure that neither employees nor employers are penalised with PRSI increases. This would mean increasing the amount workers can earn before they pay the full rate of PRSI by €29.25. We would also increase the upper threshold for the 8.5% Employers PRSI rate to €406 per week so that employers are not disadvantaged by the higher rate of PRSI. Sinn Féin would increase the tax credit for the self-employed to €1,400, in acknowledgement that the tax credit system discriminates against the self-employed in comparison to PAYE workers. We will seek full equalisation as soon as possible. Sinn Féin would broaden the Start-Up Relief for Entrepreneurs (SURE) tax relief incentive scheme to include the self-employed. The scheme aims to incentivise individuals to start and invest in their own business by claiming income tax relief upon investment in their business. As currently structured, the relief is only available to PAYE workers, to be effective it also has to be made available to the formerly self-employed. Sinn Féin would provide relief of up to €15,000 for all investments. Sinn Féin would introduce a scheme to refund VRT/VAT to taxi drivers who purchase a wheelchair accessible vehicle, with a clawback provision should they cease to operate within a certain timeframe. This scheme will support the purchase of 1,000 wheelchair accessible taxis which would bring us to over 10% of all public-service vehicle licences. With rip off mortgage rates and many families still struggling to pay their mortgage, we do not believe it is time to withdraw Mortgage Interest Relief for qualifying householders. The mortgage arrears crisis remains acute and removing or phasing out this relief this year would be counter-productive. In tandem with removing the family home tax, Sinn Féin would reintroduce the second home charge (Non-Principle Private Residence Tax) at a rate of €400 per annum. Capital Acquisitions Tax (CAT) is a tax on gifts and inheritances, which is a highly effective and fair means of redistributing wealth. Sinn Féin would increase the rate of CAT from 33% to 36%. However, we would keep the current Group A, B and C thresholds in place as they are so that passing on to close family members is largely exempted. The Help to Buy scheme was a bad idea. It tried to apply a demand solution to a supply problem. The result has been that builders have simply increased their prices to soak up the grants. As long as there is a supply drought, such demand-side answers will only be added to the price of houses. The €40 million that will be saved would be far better spent on building homes for families. Sinn Féin would increase the Betting Shop Tax and the Online Betting Shop Tax to be applied to customers at 3%. In recent years, betting duty was extended to online betting with no drop off in online betting. In the past, duty was as high as 10%. Successive governments have let the duty remain so low that it does not even cover the Horse and Greyhound Fund which is supposed to be its purpose. By introducing a rate of 3%, the duty would be sufficient to fund the industry without the need for subsidy. A portion of revenue raised from this measure would be ring-fenced to create a fund to combat addiction as recognition of the huge societal damage gambling addiction brings in its wake in line with the suggestion of Problem Gambling Ireland and the Rutland Centre. Sinn Féin supports the Irish Heart Foundation in its call for the introduction of a Sugar Tax. We would introduce a volumetric Sugary Sweetened Drinks Tax at a rate of €49.27 per hectolitre. The Irish Heart Foundation estimate that a 20% levy on sugary drinks would reduce obesity levels by 3%, which is approximately 22,000 people. Sinn Féin are committed on public health grounds to increasing the excise duty on a packet of cigarettes by 50c. In tandem with this increase, we will provide the Revenue Commissioners with additional funding to increase activity to clamp down on black market activity and protect against a rise in the illegal cigarette market. We have not included the revenue from this measure in our budget arithmetic as in costings provided to Sinn Féin and in the publicly available Revenue Ready Reckoner, the Revenue Commissioners are clear that there may be no additional revenue from this measure. Despite government spin, the cost of bailing out the banks remains a huge drain on our economy. Yet, tax law allows these banks to “carry forward” losses so that their profits are not taxed and won’t be for many years to come. Sinn Féin will make sure banks are contributing by increasing the bank levy by 10 percentage points. The special rate of 9% for hotel beds is no longer justified. It was meant to be a temporary boost, but, with hotel occupancy rates back at or even above pre-crash levels, the VAT rate for accommodation must return to the, still reduced, rate of 13.5%. Prices have increased despite this reduction and workers in the sector remain underpaid and badly treated. This proposal to revert to 13.5% does not apply to the hospitality sector in general (restaurants and pubs) but only to accommodation. Sinn Féin is proposing that money fundraised by charities from private sources and spent in the State should not end up in government coffers through VAT. Families and individuals who contribute to charities should do so knowing that the State is not ultimately taking back 23% of it. We propose opening this refund scheme in 2018 with refunds beginning in 2019. The scheme, based on the Danish model, should be capped with refunds being paid out on a proportionate basis to charities who apply. The recently produced Tax Strategy papers for Budget 2018, reference demand pressures in the commercial real estate market, which need to be closely monitored and policy tools activated if risks to financial stability emerge. The Banking Inquiry established how commercial property was a huge factor in the crash. Given the massive turnover in commercial property in recent years and huge increase in prices, Sinn Féin proposes the rate be increased to 4%. Sinn Féin would increase tax paid on the portion of individual income over €100,000 by 7c in each euro. This would only apply to 3% of individuals assessed for USC. 97% of taxpayers will feel no impact from Sinn Féin’s personal tax increases. The current earnings cap is set at €115,000. This places an overall upper limit on the amount of remuneration/net relevant earnings that may be taken into account for the purposes of giving tax relief. We would reduce the earnings cap for pension contributions to €60,000 per annum, to raise €140 million to ensure that those lucky enough to have very large pensions are paying a fair share of tax. The current Standard Fund Threshold allows an individual to get tax relief on pension contributions up to a maximum of €2 million which would entitle them to a pension pot of €60,000 per annum on retirement. Sinn Féin would reduce this threshold to €1.7 million in 2018. Sinn Féin would increase Employers PRSI on the portion of individual salary over €100,000, from 10.75% by 5% bringing the rate to 15.75%. As part of its Comprehensive Review of Expenditure, the Revenue Commissioners identified how the tax take could be increased by hiring 125 qualified Revenue staff to tackle black market activity and tax evasion, with 100 additional staff allocated to Audit departments and 25 additional staff allocated to compliance projects in areas such as fuel, tobacco, and alcohol. Sinn Féin is committed to tackling tax avoidance by the vulture funds and companies who are currently neutralising their tax liabilities with excessive deductions. The tax foregone from these structures is needed for investment in our health, housing, education, and social services. Under pressure from Sinn Féin last year, the government moved to close down some of these policy gaps which allowed vultures and others pay hardly any tax at all. There are still some glaring gaps like an exemption from paying CGT on property held for 5 years, which the Department of Finance has speculated is clogging up the property market. Vulture funds have done great damage to many families and businesses. The State should not be facilitating them through tax advantages or any other policy choices. Finance (No. 1) Act 2013, introduced Real Estate Investment Trusts (REITs) into Ireland. The REIT regime provides tax exemption in respect of the income and chargeable gains of a property rental business held within a company that satisfies a number of conditions. Dividends paid by a REIT out of its rental income will be subject to a 20% dividend withholding tax, for which recipients will be liable. However, in many cases, it is possible to reduce the rate of withholding tax under the terms of a relevant treaty between Ireland and the investor jurisdiction. In 2015, foreign investors in REITs earned €238 million in profits from their Irish property holdings but paid only €5.27 million tax to the State, an effective tax rate of 2%. Increase Dividend Withholding for non-resident investors to 25%. Abolish the CGT exemption on property sold while proceeds are kept within the fund. After coming under severe pressure from Pearse Doherty, the Minister for Finance introduced a new tax regime for funds classified as Irish Real Estate Funds (IREFs). The market value of Irish property within a fund has to be more than 25% of the value of the total fund, to be classified as an IREF. Non-resident investors in an IREF fund are then liable to a 20% dividend withholding tax on certain dividends paid to certain non-resident investors. Prior to the introduction of this change, non-resident investors could hold Irish property in Irish Collective Asset Management Vehicles (ICAV) and Qualifying Investor Alternative Investment Funds (QIAIF) and pay no tax on either rental income or the uplift in the property. Though welcome, much more needs to be done, particularly as it is estimated that tax efficient fund structures now own €13.6 billion of Irish property. Applying minimal tax on their profits and no tax on gains, they make on the vast bulk of this €13.6 billion of Irish property will result in a gigantic loss to the Exchequer. Increase Dividend Withholding Tax for non-resident investors to 25%. Reduce to 5% the Irish property holding requirement for IREF classification. Abolish the CGT exemption on property sold while the proceeds are kept within the fund. Immediately end the exemption for non-resident IREF investors from Dividend Withholding Tax, when the dividend relates to a gain from a property that has been held by the fund for more than 5 years. The Budget 2018 Tax Strategy Papers show that claims for capital allowances for intangible assets have increased from €2.7 billion in 2014 to €28.9 billion in 2015 due to the onshoring of Intellectual Property (IP) by multinational companies. This also corresponds with the 2015 GDP revision which related in part to that onshoring of IP. Sinn Féin believes that this huge increase in corporation tax write downs, was a door that was opened when the Double Irish loophole was closed and that action must be taken to protect our tax base and restore fairness. Recently, Seamus Coffey’s report on Ireland’s Corporation Tax system has recommended an 80% cap be introduced on the quantum of relevant income against which capital allowances for intangible assets (including intellectual property) may be deducted in a tax year. Restrict to 80% the annual write down of capital allowances related to Intangible Assets as a percentage of relevant income. 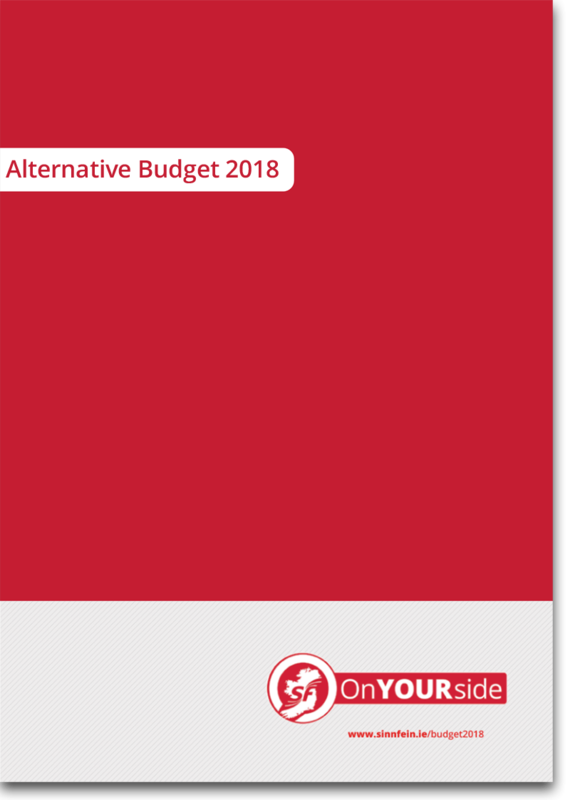 Sinn Féin remain committed to introducing a tax of 1% on net assets over €1 million with exclusions, however this measure is not included in this Alternative Budget document, as it was not possible to estimate the revenue that would be raised due to deficits in data. James and Mary are married and living in a home they own. They have two children aged 6 months and 2 years. They are currently paying for weekly childcare for both children. James works as a plumber earning €50,000 per annum and Mary works as an engineer earning €45,000. They would benefit from an increased childcare subsidy of €4,160 per child and James would also benefit from an increase in the self employed tax credit by €450 to €1,400. Furthermore, the abolition of local property tax will also help this family and both James and Mary would benefit from free a six monthly scale and polish at the dentist each, saving them €100. Laura is a single mother with two children aged four and six. Laura is in receipt of One Parent Family Payment. She would benefit from a €5 increase to her One Parent Family Payment and an increase of €50 in the Back to School Clothing & Footwear Allowance for each child. John is due to retire when he turns sixty five years old. Under Sinn Féin’s proposals instead of being forced to sign onto the dole for a Jobseekers payment of €193 per week, John would receive a State Pension (Transition) payment of €238.30 equal to the State Pension. He owns his own home and would also benefit from the abolition of property tax. Margaret cares for her son Paul at home. She looks after him on her own 24/7. Margaret receives a Carer’s Allowance payment and her son receives Disability Allowance. Both payments would be protected from inflation and increased under Sinn Féin’s proposals. They would also get relief through a proposed €100 annual bin waiver. Ciara works full time in the childcare sector earning €10.70 per hour. Ciara would benefit from the new fund which Sinn Féin propose to put in place to enable a sector wide pay agreement. This fund would provide for average salary increases of €1 per hour, which would bring her to the Living Wage of €11.70 per hour, resulting in an additional €2,028 per annum. She would also benefit from free a six monthly scale and polish at the dentist, saving her €50. A six monthly free scale and polish at the dentist, saving her €50. Jason is 24 years old, he has been unable to secure employment. Under Sinn Féin’s proposals, Jason would see an increase of €30 in his weekly Jobseekers Allowance payment. Tagann Cáinaisnéis 2018 tráth a bhfuil géarchéim gan fasach inár seirbhísí poiblí, go háirithe maidir le sláinte agus tithíocht. Tá saoránaigh ag fáil bháis ar ár sráideanna agus bíonn ar theaghlaigh a gcuid páistí a thógáil i seomraí óstán nó i lóistín atá brúite agus róphlódaithe. Tá beagnach 600,000 duine, arb ionann é a bheag nó a mhór agus daonra deich gcontae, ag fulaingt agus iad ag fanacht ar liostaí feithimh ospidéal. Tá cuid acu faoi phian ollmhór agus iad ag feitheamh ar obráidí atá ag teastáil go géar, agus fágtar go leor othar eile ar thralaithe ospidéal inár Rannóga T&É. Tá ag Geimhreadh fós le teacht. Agus le linn dó seo bheith ag tarlú, tá Fine Gael agus Fianna Fáil i mbun troid bhréagach faoi chiorruithe cánach a rachaidh chun sochair go díréireach dóibh siúd a thuilleann níos mó airgid ná iad siúd a thuilleann níos lú ar an meán. Is é an rud is mó a dhéanann idirdhealú idir Sinn Féin agus na páirtithe eile seo ná go bhfuil cearta ag saoránaigh ar sheirbhísí poiblí, cearta teach a bheith acu agus cearta ar dhínit agus iad tinn. Tá Sinn Féin ar do thaobhsa; is soiléir nach bhfuil Fine Gael ná Fianna Fáil. Táimid soiléir air seo, agus na cúinsí seo ann, nach bhfuil aon spás ann le haghaidh ciorruithe cánach do lucht an rachmais sa cháinaisnéis seo agus go gcaithfear gach acmhainn atá ar fáil a úsáid le tosú ar dhul i ngleic leis na mórghéarchéimeanna in infrastruchtúr sláinte, tithíochta agus caipitil. Is mar gheall ar bhlianta de neamart agus d’fhaillí inár seirbhísí poiblí agus rialtais bheith ag tacú le forbróirí agus le hamhantraithe réadmhaoine a tháinig na géarchéimeanna seo chun cinn. Tá scothaicme rachmasach ann a bhaineann brabús go fóill as an ngnáthmhuintir sa stát seo. 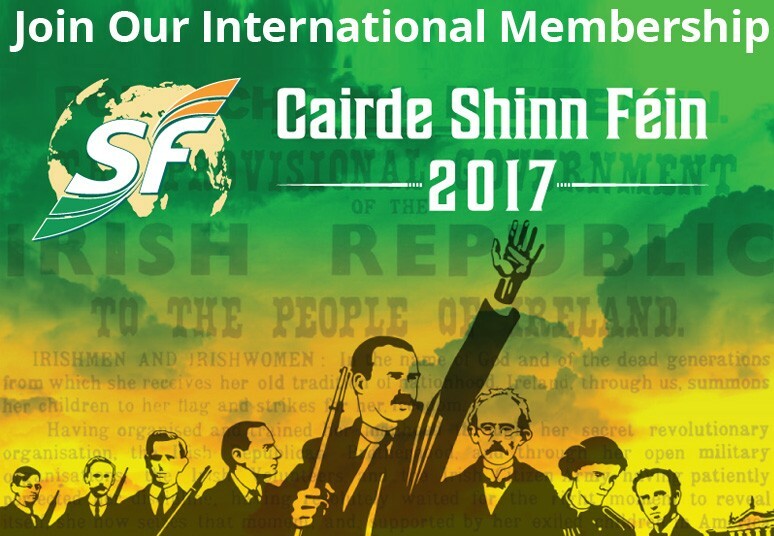 Leis an gcáipéis seo, tá taobh roghnaithe ag Sinn Féin, taobh na gnáthmhuintire nach ndeachaigh an téarnamh chun sochair dóibh go fóill agus a bhfuil seans ag teastáil uathu. Is mó i bhfad an sochar a bhainfí as infheistíocht a dhéanamh in ospidéil, i scoileanna agus i dtithe ná an euro nó dhó sa bhreis sa tseachtain a gheobhaidh bunús na n-oibrithe as ciorruithe molta cánach Fhine Gael agus Fhianna Fáil. Tá sé thar am go mbainfeadh an ghnáthmhuintir buntáiste as an ngeilleagar, ní scothaicme rachmasach amháin. Tá an tseirbhís sláinte as feidhm; is é seo an t-am chun í a chur ar ais ag obair dúinn uile. Tá óige na tíre seo á bhfágáil ar gcúl; ní mór todhchaí níos fearr a chruthú dóibh. Tá neamart á dhéanamh ar sheandaoine; is é seo an t-am ar chóir go mbeadh an cúram agus an dínit atá tuillte acu. Tá an iomarca brú ar ár dteaghlaigh, mar gheall ar chostais chúraim leanaí atá i bhfad ró- ard; is é seo an t-am chun caighdeán maireachtála níos fearr a chruthú. Léirímid sa cháipéis seo freisin plean uaillmhianach le haghaidh caiteachais chaipitil atá riachtanach má táimid le teacht slán ó thionchar na Breatimeachta ar ár ngeilleagar. Ní mór don rialtas tabhairt ar an Dáil tacú le Sainstádas Speisialta don Tuaisceart laistigh den Aontas Eorpach le go mbeidh cosaint ag cearta gach saoránach in Éirinn. Is é seo an t-am le haghaidh cainaisnéise, agus le haghaidh rialtais, atá ar do thaobhsa. Rachfar i ngleic le géarchéim na dtralaithe agus tabharfar aire do dhaoine scothaosta. Cuirfear ar fáil 500 leaba breise in ospidéil, 2 mhilliún uaireanta breise de chúnamh baile agus 2,500 pacáiste breise de chúram baile. Laghdófar faoina leath táillí naíolann le haghaidh tuismitheoirí agus beidh méadú ar phá ar fud na hearnála. Beidh méadú de €5 ar gach íocaíocht leasa shóisialaigh aoise oibre, €4.50 le haghaidh pinsinéirí agus glacfar an tIdirphinsean ar ais, agus beidh méadú de €6 do dhaoine míchumasacha. Beidh níos lú ranganna ann ó bhunscoileanna ar aghaidh go hinstitiúidí teicneolaíochta, 950 post le haghaidh múinteoirí acmhainne agus SNA, agus laghdú de €500 ar tháillí mic léinn tríú leibhéal. Earcófar 800 garda nua agus 500 d’fhoireann shibhialtach le dul i ngleic le hoidhreacht na déine inár gcóras dlí. Cothromaíocht i gcúrsaí pá ar fud na hearnála poiblí. Plean chun tionchar na Breatimeachta a mhaolú lena n-áirítear tacaí le fiontar agus mórchlár infheistíochta caipitil. Is é an toradh a bheadh ar Cháinaisnéis Shinn Féin le haghaidh 2018 ná 5,000 oibrí sa bhreis a fhostú sa líne thosaigh agus tacódh infheistíocht bhreise Chaipitil le 16,000 post freisin. * Chun infheistíocht rialtais a ghríosú i gcúrsaí caipitil arb ionann é agus Ollfhoirmiú Caipitil Seasta (OCS) de réir na Rialacha Fioscacha is féidir an infhe- istíocht seo a dhéanamh ar an méan thar thréimhse de cheithre bliana, agus ciallaíonn sé seo nach n-úsáidfidh méadú san OCS ach ceathrú amháin den spás fioscach agus a úsáidfeadh méadú comhionann sa chaiteachas reatha sa chéad bhliain. Ní hionann deontais áirithe agus OCS, áfach, agus ní siad de réir smúdála agus dá bhrí sin tá siad as an áireamh. 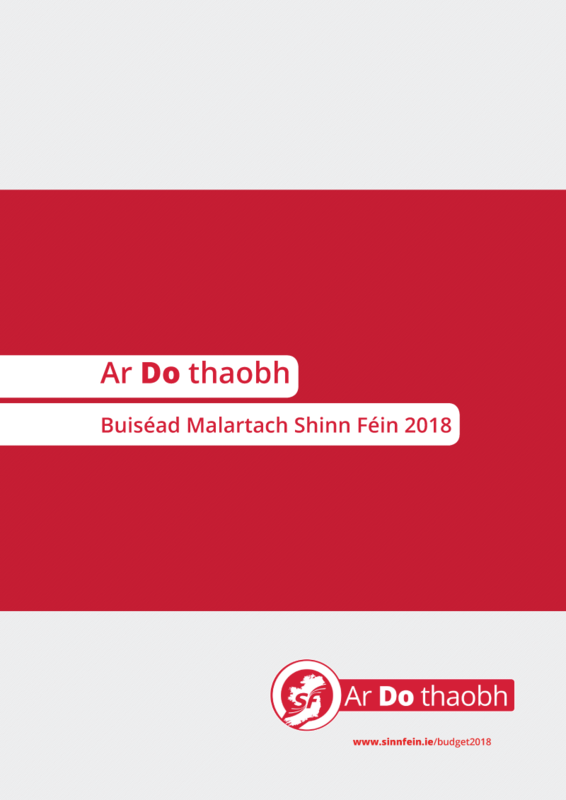 ** Comhairle Fhioscach Chomhairleach - Ráiteas Réamhchainaisnéise 2018, Tábla 3: Spás Fioscach le haghaidh Cháinaisnéis 2018 - Acmhainní Ainmniúla le haghaidh Bearta Nua, €650 milliún. Fóirdheontas bliantúil ón stát le haghaidh scoileanna príobháideacha a bhaint ar shiúl thar thréimhse 5 bliana. an costas go dtí seo ar achomharc ar chás cánach €13 billiún Apple. líon na ndaoine atá ar liostaí feithimh in ospidéil phoiblí. an líon daoine a mheastar a mbeidh cónaí orthu i seirbhísí do dhaoine gan dídean ar Lá na Cáinaisnéise. an céadatán daoine a bhfuil cónaí orthu i seirbhísí do dhaoine gan dídean atá 24 bliain d’aois nó níos óige. an líon daoine fásta atá ina gcónaí ag baile lena dtuismitheoirí. luach na réadmhaoine atá i seilbh cistí infheistíochtaí cáinéifeachtúla. céadatán na bpáistí i dteaghlaigh aontuismitheora a mhaireann faoi bhochtaineacht de shíor. luach na tradála Thuaidh/Theas a bhféadfadh tionchar bheith ag Breatimeacht air.